Well, we were properly shafted!! We had agreed to volunteer at Maya Pedal, an NGO repairing bikes for local use and making pedal-powered machines. Sean was to help in the workshop and I was hoping to help with communications. We were to stay in the volunteer accommodation, which was described as ‘basic’. We had been emailing Mario about the arrangements. We rattled over the cobbles out of Antigua in a taxi with no suspension for the half hour journey to San Andres Itzapa. On arrival the driver insisted we take his card with his phone number before departing.We knocked on the big tin door and a young man, Henry Alexander, let us in, closely followed by his father Pedro. Our eyes stinging from burning wood smoke, behind them we could make out a large concrete structure and a scruffy yard. Pedro then introduced us to his wife, Erlinda, and his mother-in-law. They seemed to be cooking stew in a pot over an open fire. They lived on site along with three other kids, and Pedro worked on the bikes. Henry quickly took us back to the entrance to extract the $200 in cash that was our contribution and explained that Mario would be back later. We were then shown our accommodation and I have to say we were shocked, although we tried to stay positive and not be judgemental. Our room had no door or window. There was an entrance way and a glassless, inward looking window, both covered by a curtain. 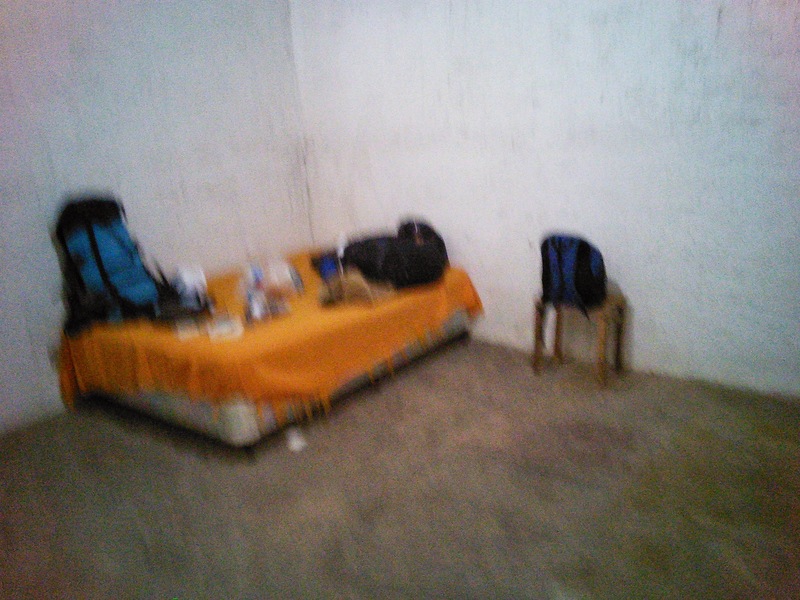 There was no furniture except a bed that had no sheets, blankets or pillows. The walls had been whitewashed and the floor was dirt. We smiled politely and put our things on the bed, very disappointed because one of the things we had been looking forward to was unpacking for a while. We were then shown the kitchen – a tiny room with a small sink, an ancient gas stove and a small heap of utensils. I gingerly opened the fridge which was completely iced up and contained a dying cauliflower and a pot of leftovers. When I later told Sean we should steer clear of the fridge he suggested cleaning the whole place up but there were no cleaning products or cloths to be seen. Finally, the bathroom, a large cold shower (I politely assured Erlinda this was not a problem as I know not everyone in Guatemala has hot water), a functioning loo and loo roll, and a sink – face down on the floor! There was still no sign of Mario so we tried to engage the family in conversation. Pedro was not able to tell us much about the bikes that Sean had been eyeing up though Erlinda did reveal that there had been a couple of other volunteers in the three months that they had been there, the longest staying for two days. There were no other workers. Erlinda was also disappointed that we declined her offer to cook for us (for $135! each? Per month?). Sean and I decided to go and explore the town. We trudged up the hill in the heat and bought a coke, and seemed to be over the shock enough to finally try and rationalise the situation and work out what to do. Neither of us were keen to bail out. I said I thought we coukd maybe try it for 2 weeks and Sean said this was 2 weeks longer than he thought I’d give it. We had really wanted to come and help here and didn’t want to be incapable of tolerating the conditions the locals put up with. On the other hand, we had had no welcome, no information and Sean had serious doubts about the project as a whole. We tried to work out how we could make it doable. We would buy a big bucket so we could wash clothes and utensils. We would buy detergent and throw ourselves into making the place habitable. After a while we returned to the workshop. Still no sign of Mario so more hanging about. Henry said he was expected in 20 minutes. By this time we were having serious doubts. We had been waiting for more than 2 hours. I was concerned that it gets dark around 5 and it gets cold at night in the mountains. We would be freezing in our cell overnight. We decided we would give Mario 30 minutes and if he didn’t appear we would call our taxi to take us back to Antigua. 40 minutes later we went to tell the family that as Mario wasn’t there and we didn’t know what to do we were leaving and would call Mario the next day. Could we use their phone? No, it wasn’t possible to ring out. So we rang the taxi on Sean’s mobile and the taxi driver agreed to pick us up in an hour. As we left the building laden down with luggage Mario and his wife miraculously appeared, obviously warned by the family and able to get there when it suited him. Welcome to Guatemala, he cried. Hmmmm. We weren’t impressed! We don’t know what work there is to do; there are no blankets; it’s getting cold! I have blankets at my house. Lucky you!!! Mario obviously had no qualms about living in far more comfortable conditions than his workers. We said we would call the next day and left. We made it back to Antigua and found a room in a nice hostel but as all our plans for the next few weeks/months are out of the window we have to decide what to do next.